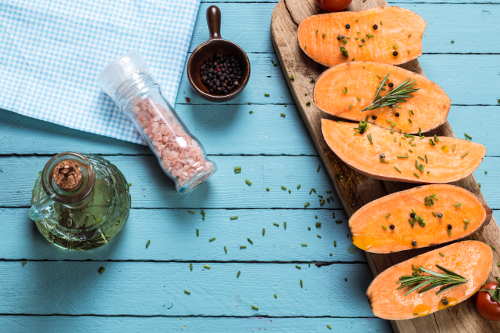 Although many people tend to avoid starchy carbohydrates, the sweet potato is often the exception to that rule. That is because sweet potatoes are loaded with nutrition and health benefits. There are many sweet potato recipes that are very enjoyable. Sweet potatoes are loaded with antioxidants, especially vitamin A and vitamin C. They also contain fiber, potassium, iron, manganese, copper, and vitamin B6. The orange root vegetable is also low on the glycemic index, and it can lower insulin resistance and stabilize blood sugar levels. Eating sweet potatoes can also lower blood pressure, improve digestion, promote fertility, reduce the risk of cancer, boost immunity, and decrease inflammation. But, what makes sweet potatoes so delicious? What matters is how they are made. When many people think of sweet potato recipes, often sweet potato fries come to mind. However, as long as sweet potatoes are not deep-fried, they are actually quite healthy. Besides sweet potato fries, this orange vegetable is very versatile. Many people don’t know this, but you can juice a sweet potato. It tastes rather delicious, especially when combined with carrots, lemon, apple, and turmeric. Overall, this juice provides a sweet flavor with a savory turmeric kick. The sweet potatoes add a different sweetness than fruit, and they offer a slightly thicker consistency than other juices. Try this sweet potato juice recipe. In a juicer, combine sweet potatoes, carrots, lemon, Granny Smith apple, and turmeric root. Whisk and pour into a glass, or store for a day in a large Mason jar. You also have the optional to mix in colloidal silver for some added nutrients. Hash browns are typically served alongside eggs and bacon with some toast. That being said, if you are looking for something a little less greasy, sweet potato hash browns make for an excellent nutrient-dense breakfast side. The following sweet potato recipe will only take about 30 minutes to make, and it serves up to six people. This side is perfect with some sautéed spinach, tomatoes, and a soft-boiled egg. Heat a large skillet over medium-high heat and add onions. Season with salt and pepper. Add the garlic and grated sweet potatoes. Next, sauté the mixture for 10 to 15 minutes, or until sweet potatoes are tender and the onions are translucent. Transfer the sweet potato mixture to a baking pan, and brush with the egg wash. Broil for five minutes, or until the potatoes have reached your preferred crispiness. They should be a little browned on top. Serve right away with eggs and vegetables, or store in an airtight container in the fridge. There is a sweet potato fries recipe on this list, but it likely isn’t what you may expect. Although you have probably tried sweet potato fries before, did you know that most varieties of sweet potato fries in the grocery store or at a restaurant contain gluten? It’s true. Luckily, when you make your own, you don’t have that problem. Here is a gluten-free sweet potato fries recipe that will have you making this recipe over and over again. Slice the sweet potatoes into shoestring fries, or as close as your knife skills permit. Combine the fries with olive oil, lemon juice, oregano, thyme, onion powder, garlic powder, salt, and pepper. Marinate in the refrigerator for one to three hours. When you are ready to cook, preheat the oven to 450°F. Prepare a baking sheet lined with parchment paper, and evenly place the fries on the sheet. Bake them for about 45 minutes, until they are crispy brown. Meanwhile, for the cashew mayo, soak the raw cashews for about three hours. Place all mayo ingredients into a high-speed blender or food processor, and mix on high until creamy. You may need to scrape the side of your appliance with a spatula. You can also add some more water for your preferred consistency. Serve the hot sweet potato fries with the cashew mayo. Sweet potatoes also combine with quinoa to make sweet potato patties. Quinoa is gluten-free and loaded with manganese, magnesium, iron, and the amino acid tryptophan. It also won’t take you too long it to make this patty recipe either. In total, you are looking at about an hour of your time. All your hard work will produce about 12 patties that you can store in an airtight container, and saved for later in the week. Prepare quinoa according to package instructions. It usually takes about 15 minutes on the stovetop. Preheat the oven to 400°F, and pierce the sweet potatoes. Bake them for 45 minutes, or until soft. Remove the skin, and mash with a fork to remove all the chunks. Place them in a large mixing bowl. In a skillet, sauté the onions, olive oil, and sea salt over medium-low heat, until the onions are translucent. Add the garlic and cook for another minute, and stir constantly to prevent the garlic from burning. Then, add thyme at the end, and mix well. Add the onions, quinoa, a quarter teaspoon more of salt and some grounded pepper to a large mixing bowl. Add the sweet potatoes, and stir well until combined. Form the mixture into golf ball-sized balls, and flatten them into patties. Cook on a skillet with ghee or coconut oil for about two minutes on each side. You want them to brown up and become crispy. Sprinkle on some fresh thyme and more salt. You can also have sweet potatoes as dessert, too. No, really, you can. The following is a tasty recipe for sweet potato brownies that is impossible not to enjoy. You can have the brownies for dessert, or have them for snacks throughout your day. Try this sweet potato brownie recipe. Preheat the oven to 350°F. Coat an eight-inch square pan with coconut oil and powder with flour. Melt the chocolate and coconut oil over low heat. Combine sweet potato, honey, sucanut, cacao powder, applesauce, and vanilla. You can use a blender or food processor. Add the chocolate and oil mixture, and blend until smooth. It should be creamy, but not too dry. Transfer the ingredients to a bowl. Mix in the baking powder, flour, sea salt, cinnamon, and cayenne, if using. Pour the batter into the pan, and smooth it out with a spatula. Bake for about 35 to 40 minutes. You should be able to insert a toothpick in to make sure it is cooked all the way through. It should also be firm when you press down on the brownies. Cool completely on a wire rack. Once cool, cut into bite-sized pieces, and store in an airtight container. Although when you think of sweet potatoes, turning them into deep-fried fries may be on your mind. That being said, the sweet potato is incredibly versatile. Next time you look in your cold storage and find a pile of sweet potatoes, consider making sweet potato juice, sweet potato hash browns, sweet potato patties, or sweet potato brownies, instead. However, if you just can’t say no to your sweet potato fries craving, try a healthier gluten-free version. Now, as you see, there are plenty of ways to pass the sweet potato. “Be Radiant,” Village Juicery; http://www.villagejuicery.com/menu/be-radiant/, last accessed February 24, 2017. Telpner, M., “Crispy Baked Sweet Potato Fries + Cashew Mayo; Meghan Telpner; http://www.meghantelpner.com/blog/recipe-crispy-baked-sweet-potato-fries-cashew-mayo/, last accessed February 24, 2017. “Sweet Potato Quinoa Patties,” A House in the Hills, January 13, 2014; http://ahouseinthehills.com/2014/01/13/sweet-potato-quinoa-patties/. Webber, J., “Turmeric Sweet Potato Orange Juice,” Reboot with Joe; http://www.rebootwithjoe.com/turmeric-sweet-potato-orange-juice-recipe/, last accessed February 24, 2017. Telpner, M., “Sweet Potato Brownies,” Meghan Telpner; http://www.meghantelpner.com/blog/oooey-gooey-fudgey-healthy-brownies/, last accessed February 24, 2017. “Sweet Potato Hash Browns Recipes,” Dr. Axe; https://draxe.com/recipe/sweet-potato-hash-browns-recipe/, last accessed February 24, 2017.